When the expiration date is approaching, you will receive a reminder email about an upcoming payment in order to make sure you enjoy the uninterrupted services for your subscriptions. Previously, the issue with service renewal notifications caused an unexpected suspension of subscription services for users, who were unaware of their outstanding invoices. Needless to say, this was causing a major inconcenience for some of our users, as well as our partners, who were loosing their customers. 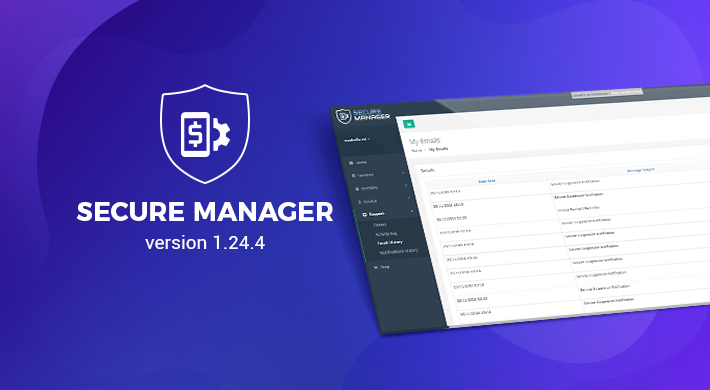 By addressing this issue in the latest instant of Secure Manager, our aim was to ensure that both our users and partners are always up-to-date in regards to the status of their subscriptions and pending payments, in order to enjoy uninterrupted service. Since we are constantly striving to improve and innovate, we depend on your feedback to help shape how our products and services evolve. Please follow the link below in order to share your thoughts and ask any questions you might have.